Alison Donnelly has suffered for love. Still stuck in the small Northern Irish town where she was born, working for her father’s real estate agency, she hopes a second marriage will help her get her life back together. Her sister Liz, a fiercely independent professor who lives in New York City, is about to return to Ulster for Alison’s wedding, before heading to an island off the coast of Papua New Guinea to make a TV show about the world’s newest religion. Both sisters hope to write their own futures, but the past has other ideas. Alison wakes up the day after her wedding to find that her new husband has a past neither of them can escape. While Liz, in a rainforest on the other side of the planet, finds herself increasingly entangled in the eerie, charged world of Belef, the charismatic middle-aged woman she has come to film, the leader of a cargo cult. As Modern Gods ingeniously interweaves the stories of Liz and Alison, it becomes clear that both sisters must learn how to negotiate with the past, with the sins of fanaticism, and decide exactly what the living owe to the dead. Laird’s brave, innovative novel charts the intimacies and disappointments of a family trying to hold itself together, and the repercussions of history and belief. Nick Laird was born in Northern Ireland and studied at Cambridge and Harvard. He has published two novels, Utterly Monkey and Glover’s Mistake, and three collections of poetry, To a Fault, On Purpose, and Go Giants. He is the recipient of many awards for his fiction and poetry, including the Betty Trask Prize, the Rooney Prize for Irish Literature, the Geoffrey Faber Memorial Prize, and the Somerset Maugham Award. A Fellow of the Royal Society of Literature and a 2016 Guggenheim Fellow, he teaches in the creative writing program at New York University. "Nick Laird's prose disseminates unease -- a sure sign of originality. The aura of danger derives not so much from his theme (how religious faith is inseparable from violence) as from his sensibility: the reader feels the ever-present likelihood -- the risk -- of confrontation with unpalatable truths. Laird is a poet-novelist; his fictional world may be harsh and raw, but it is balanced by the imaginative habits of a poet, which always tend towards forgiveness and, indeed, towards celebration." "In Modern Gods, Nick Laird takes two experiences poles apart and unites them in gorgeous language, with the same fierce tenderness as he employs in his poetry. It’s about families, tribes, peoples – and if you’re a member of any of those you’ll find a home both strange and familiar in this story." “Nick Laird knows a great deal about violence, physical, emotional and spiritual, and of how it eats into the lives both of survivors and perpetrators, and continues to corrode, like a slow-acting acid. 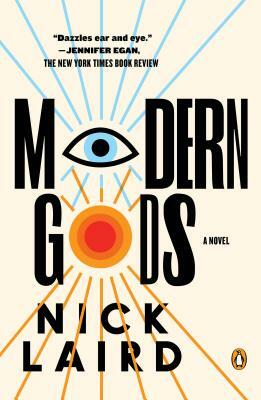 Modern Gods is a big, tightly-packed book that lives up amply to its high ambitions."